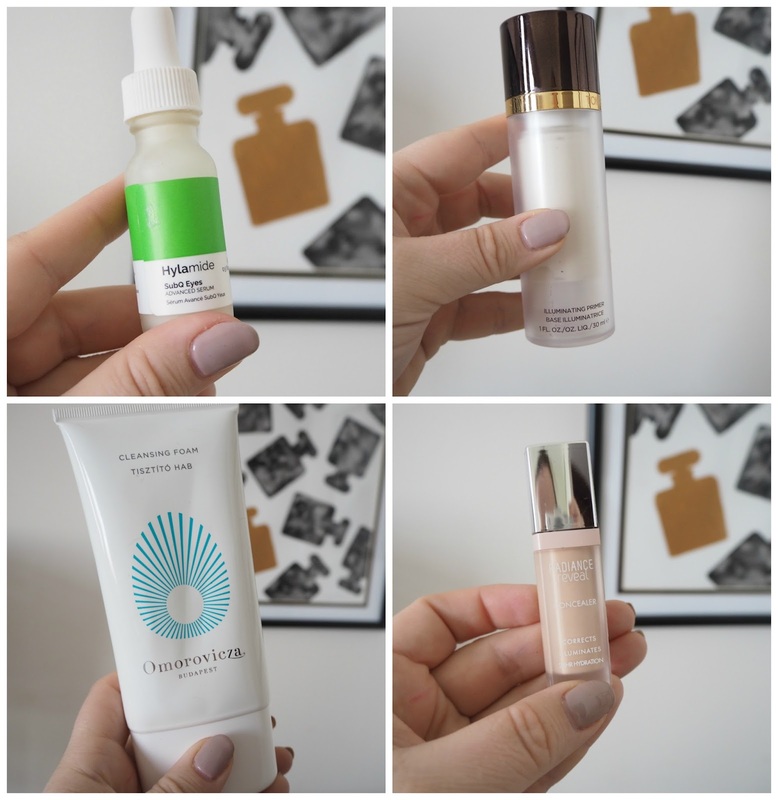 Here's the sixth installment of 'four things I am using right now' where I give mini (kinda) reviews of things I am using every day right now. First up, the wonderful people at Deciem sent their Hylamide SubQ eye serum over for me to try and it's another product of theirs I can only say great things about. The Hylamide SubQ eye serum is a cocktail of anti aging peptides and retinol wrapped into a light, liquidy serum. The serum aims to address many 'eye related' concerns such as anti-aging, sagging skin/lack of firmness, dark circles and loss of hydration and it does so in a formula that is almost as light as water and absorbs instantly. It sits perfectly under make up, leaving no residue or stickiness. I like the pantone inspired simple packaging but I don't use the dropper mechanism-just like I don't with the Niod Photography Fluid. I simply swipe the dropper under my eyes, a little bit really goes a long way with this serum. I first read about this serum on Caroline Hirons blog and she criticised the packaging and Brandon Truaxe, the founder of Deciem responded to her criticism with an explanation as to the rationale behind the packaging-I have linked the post here and it's definitely worth reading his comments. I also found another post where Brandon took the time to respond to almost all the comments on Carolines post-I wish all skincare companies were as engaged with their clients as Deciem clearly are. Because it doesn't contain silicone you don't get that heavy duty 'smoothing effect' silicone packed eye creams can give-you may need to apply something heavier on top if you seek that smoothing effect before applying make up on top. Silicone though is just a temporary 'filler' with no real skin improving benefits. You get a lot of technology and science for the price point of £28 and this is an eye product I would happily repurchase and use-it's a brilliant all rounder. The primer does feel quite slippery (almost greasy) on the skin and leaves skin with a veil of radiance-there is no glitter or shimmer-it's just illumination. The primer claims to contain ingredients that improve the texture and tone of the skin and enhance cellular repair. If you're looking for hydration or oil control or a primer that increases the longevity of your base then you're unlikely to get that from this primer-you're just going to get a smooth and illuminated canvas on which to apply your foundation. I have found my foundation sits nicely on top and it's umm nice. But it's not phenomenal. 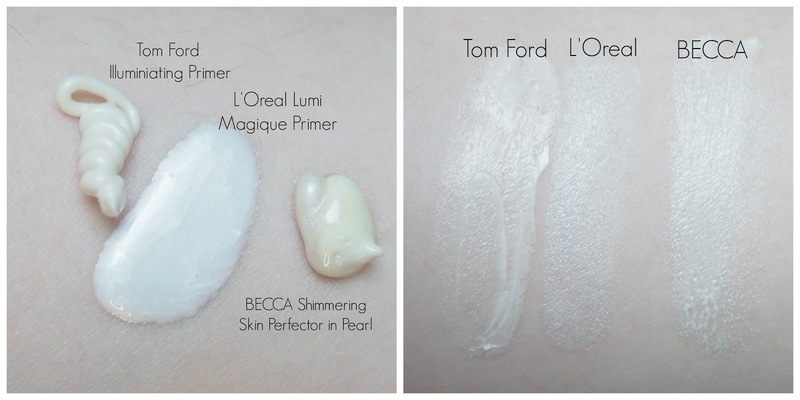 I compared it to two of my favourite illuminating primers and found BECCA Shimmering Skin Perfector in Pearl to be pretty much an exact dupe-the tone of the TF is slightly warmer/more yellow toned but you really wouldn't see that with foundation over the top. The base is slightly pearlised and leans much more yellow compared to the whiter than white L'Oreal Lumi Magique which is also much runnier in consistency. The BECCA is almost half the price of the Tom Ford though so personally, I would go for that one. The Lumi Magique is a brilliant drugstore option and I really love it for an illuminating base. The Omorovicza cleansing foam is also a perfectly nice, lightly whipped mousse cleanser that is perfect for a light morning cleanse and rinses cleanly. What stops me repurchasing, like the Tom Ford, is the steep price tag and the lack of any visible benefits to using it. It's £44 and I bought it because it was recommended for 'easily upset complexions' which is definitely how I would describe my skin type. This cleanser is marketed as a 'suitable for all' cleanser that clears congestion, soothes sensitivity and redness and combats dryness. The key ingredients-Copper Gluconate works to purge pores and detoxify, White Lupin revitalises and Apple Pectin provides long-lasting hydration and suppleness. It's not a heavy duty enough cleanser to use as a make up removing cleanser and for me it definitely sits in the 'morning cleanser' category. It doesn't strip the skin but I didn't find it particularly softening or balancing, or clearing or detoxifying. For £44 it should be amazing and I should love using it but I just dont't. I will say though that a little goes a long way and it is lasting a long time! I bought this serum concealer when my Bobbi Brown Intensive Serum Corrector finished and I loved that Bobbi Brown one so much! (although admittedly it is about the only thing I do love from Bobbi Brown though....) The Bobbi Brown is a corrector rather than a concealer but I really liked the consistency so I thought this Bourjois one might be similar. I don't personally love the Bourjois version-although the texture is nice and fluid, I find it much heavier than the Bobbi Brown version and that it can crease under my eyes. My major problem though is the shade is far too yellow for me-and I have bought the lightest shade available. The shade is relatively close to my natural skintone so it doesn't really conceal and brighten the area. The fluid consistency means it's not really suitable for concealing blemishes so this is a bit of an all round miss for me. I've seen a lot of positive reviews but this just isn't for me. *This post contains an eye cream gifted to me by Deciem. Thoughts and opinions are of course, my very own.